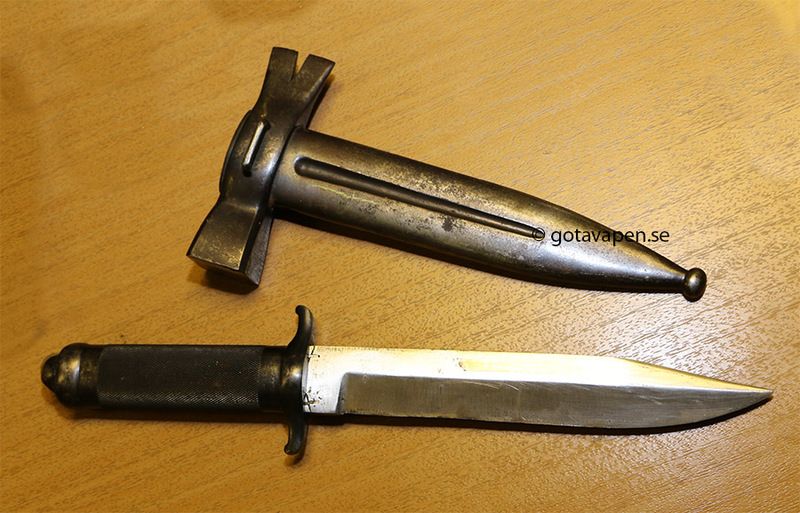 The use of Walk Out or Dress bayonets and daggers was popular basically in Germany and primary from the time of Weimar Republic until the end of WW2. 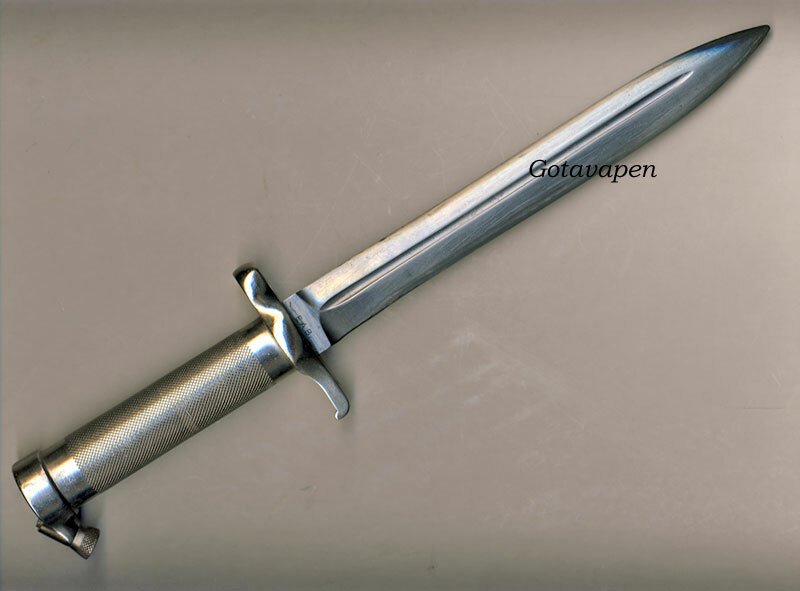 The German walk out bayonet appeared in many types and variations. Different branches of military had different models, marks and decorations. Even civilian and police organisations used these types of side-arms. The origin might be the KS98 bayonet, which was introduced 1901 and was produced in many examples like "Extrawaffen" for commercial use. 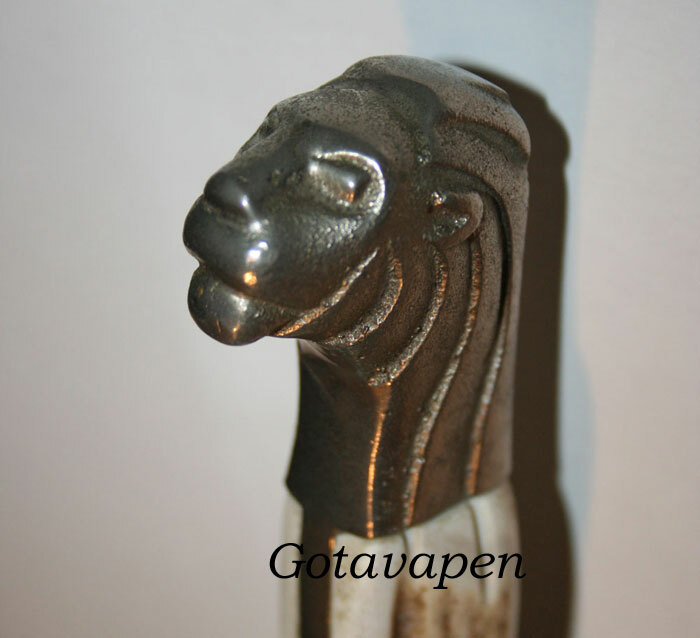 However in Sweden there is no tradition of Walk Out bayonets with uniform, but there are many collections with so called Walk out bayonets with a lion head pommel. There are also standard all nickel m/1896 bayonets and some other variations based upon this bayonet. The German walk out bayonets existed in many types and variations. Here is a short model of these. The background to the production of the walk out bayonet will be found when Frost Anders Mattson Jr. studied in Germany at the end of 1920:s and first part of 1930:s and witnessed the rise of the 3rd Reich, without accepting their ideology! He became manager of F. M. Mattsons (FMM) Company in Mora. 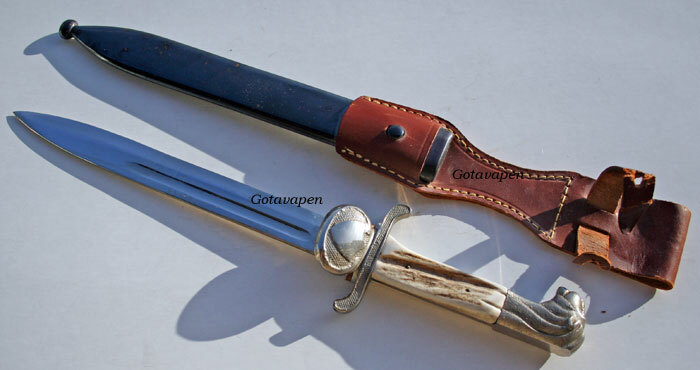 The German walk out bayonet was an accepted attribute to the German uniform at that time, but the Swedish counterpart made by FMM had no connection what so ever with the Swedish armed forces. It was never allowed to be worn together with the uniform at that time or later. There are however reports from a well known collector Hutte Benckets who made his military service 1941-43 who reported that one senior officer used such a Walk Out bayonet at parades. There are other bayonets found marked "Tyg avd Lv 7 - 26 sept 1945", which indicates Anti Aircraft regiment No 7. 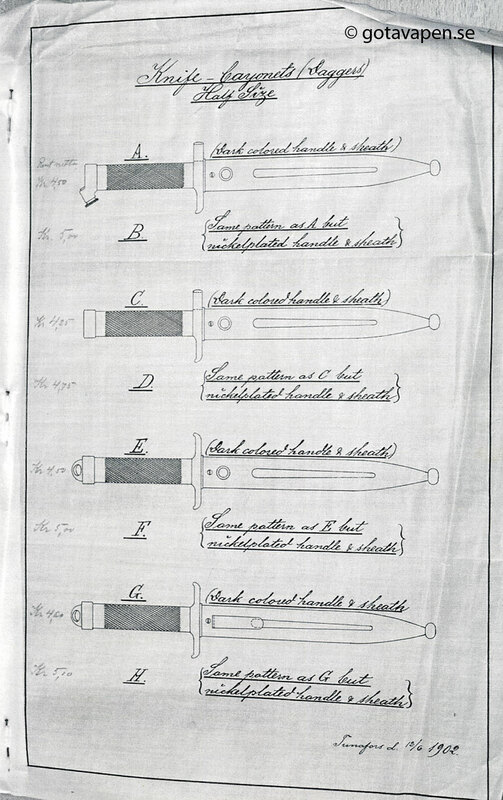 There are other bayonets found also with provenance indicating that these knives were used by military personal in uniform although not authorised. The bayonet was only meant as a decoration on the wall or on a desk. It was however sold under the name of Walk out bayonet or “On Leave Bayonet” (Permissionsbajonet”). The nationalistic feelings still rang high since 1939-1945. 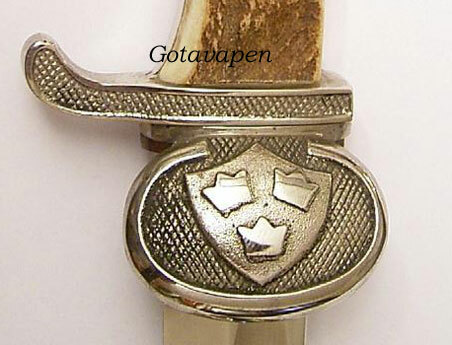 A sign of this is the pommel in form of a lions head, which is a part of the Swedish National Arm. 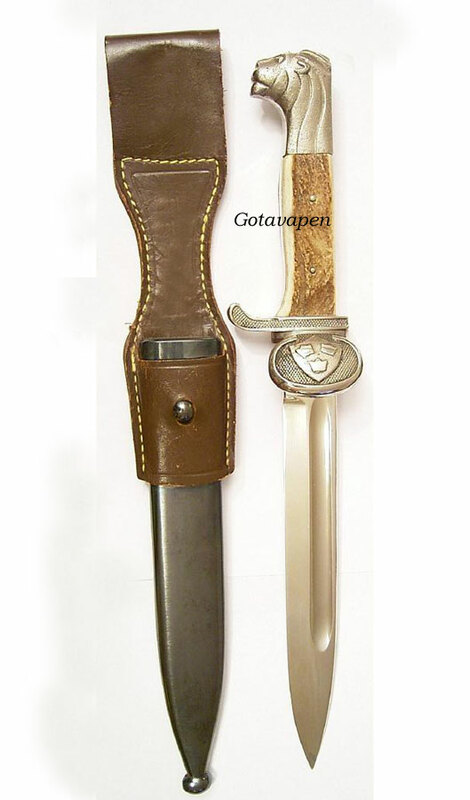 The Swedish Walk Out bayonet started to be produced from 1939 to 1962. 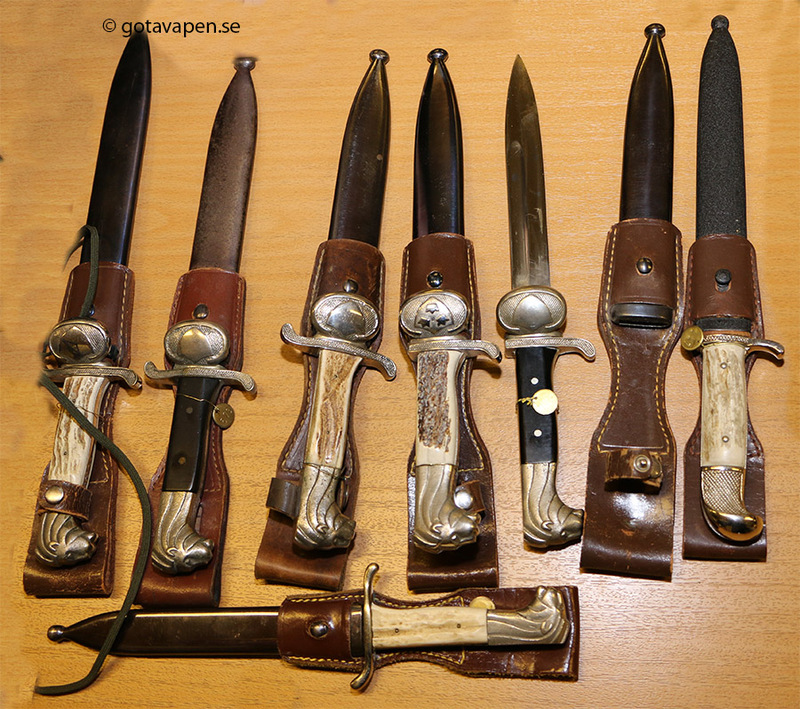 These bayonets and knives were sold in sport shops and a company called “Vapendepoten” (Depot of arms) in a town called Falun. You can see their catalogue here from that time. FMM ceased production 1962 due to weak market. 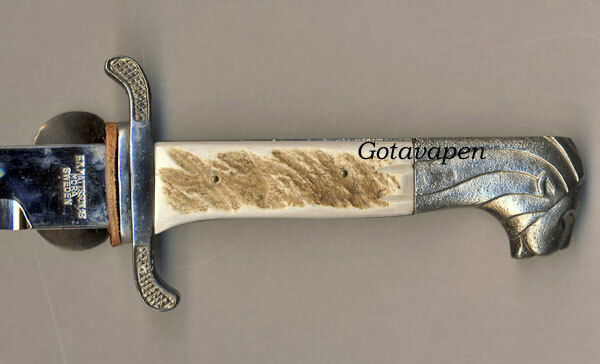 All of them have grips of elk horn on top of nickel-plated brass. The blades are polished nickel-plated. Scabbards are made of gun blue steel. The frogs are made of brown leather. 100 Single cross-guard, hand protection. Length 330 mm. The very first of these bayonets had a hand guard in form of a shield decorated with three crowns. This was prohibited by the Governmental heraldist because the crowns were symbols of the small Swedish Arm only to be used by the Government and king. A small amount of these bayonets went out on the market before they were banned and these are very rare to find nowadays. 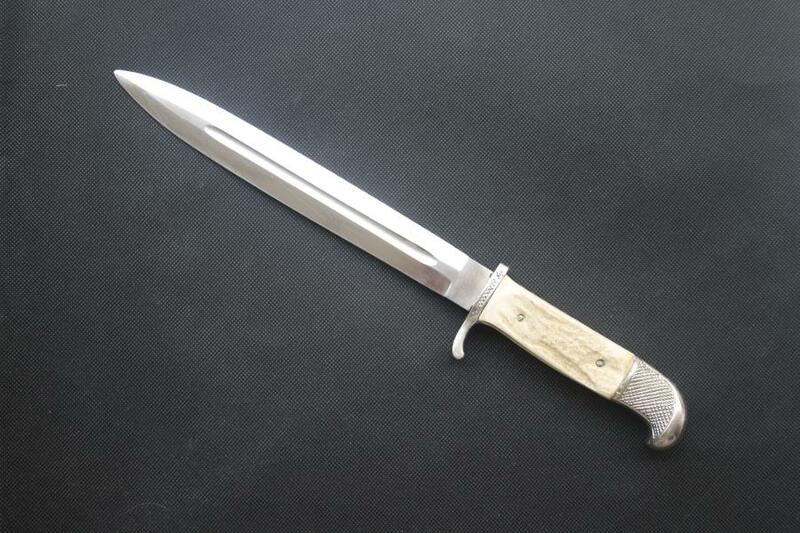 Another type of knife more close to a dagger was made by Frosts knife factory AB. They were sold by Böhlmar Co in Mora. The market for these was people in outdoor activities like hunters. 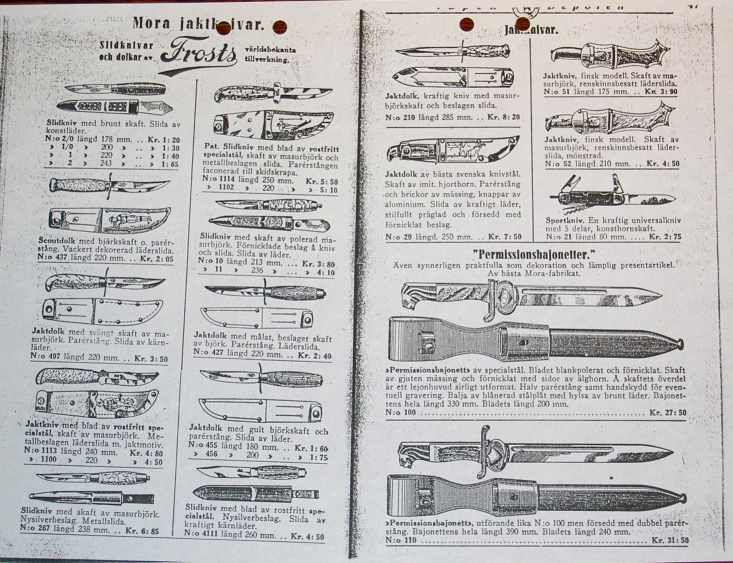 The advertisement often called the knives suitable for hunters! There is provenance that at least one of these daggers was used as a fighting knife or field knife as it was later called in Sweden. 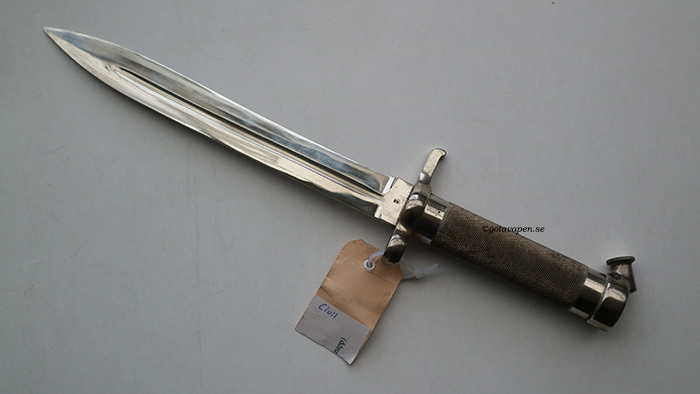 Swedish military type commercial models of bayonet m/1896 with nickel finish. 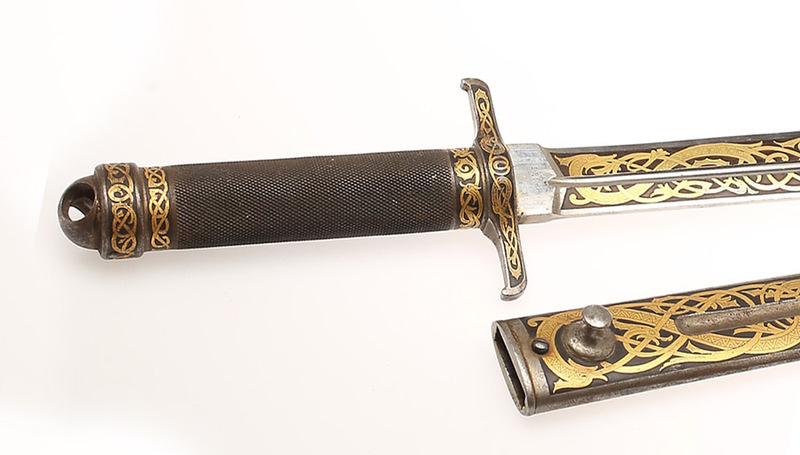 There are many bayonet m/1896 with nickel plated grips and scabbards in collections. 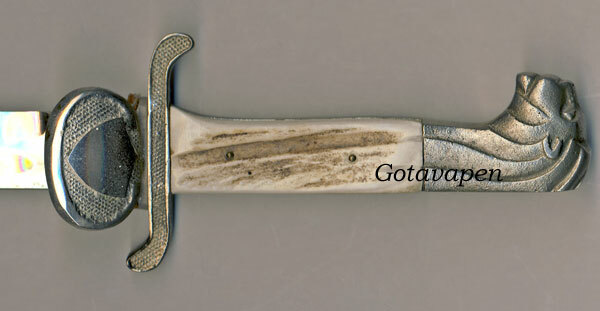 1903 Tunafors Company sold variations of bayonet m/1896. These were called Knife bayonets or Hunting Daggers. 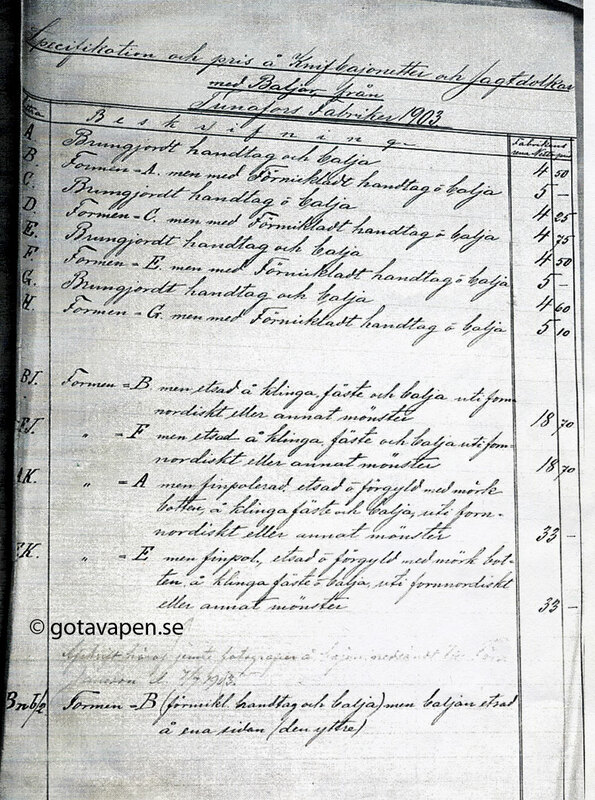 Prices in Swedish Krona (SEK) 1903. There are also some rare with etchings. Form BJ above. 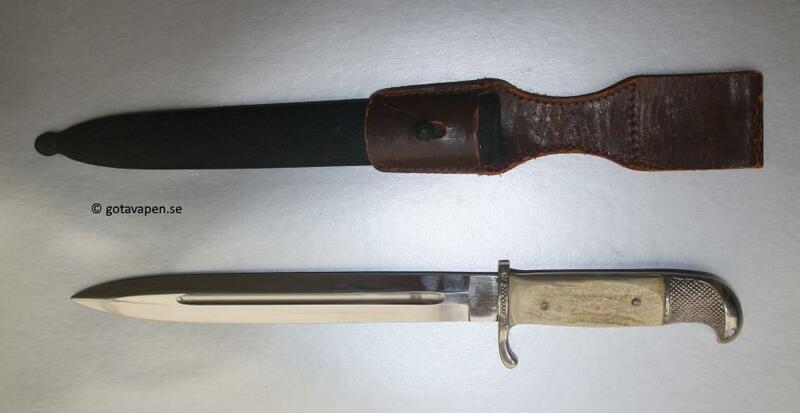 There is also an unusual bayonet based on the same construction like m/1896 but without a lock for the rifle. The blade is identical. Here are Hunting Daggers with double sided cross guard with no hole for a barrel. 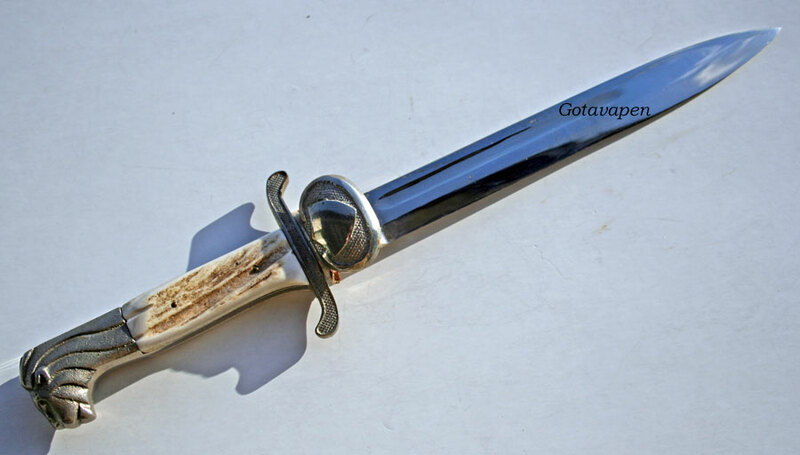 This bayonet can be found with black grip and also nickel-plated grip and in rare cases with etchings. The later model is often marked with a ‘+’ stamp instead of acceptance mark. This + mark is indicating rejection. Bayonets with military unit numbers are most likely only bayonets which were plated after the military use by civilians. A military bayonet would never leave the factory in such an appearance! And this very special item. Maybe a private purchase tool or a test item for the Military Signal corps. Same type of grip and cross guard but different blade and scabbard! Based on an article in Swedish on the Swedish website made by Per Holmback. Skanes Vapenhistoriska Forening, meddelande 199, augusti 1997. Artikel av Olle Svensson. Frost knivfabrik AB Mora by Per Brask. "Seitengewehr: History of the German bayonet 1919 to 1945", by George T Wheeler. 1999.